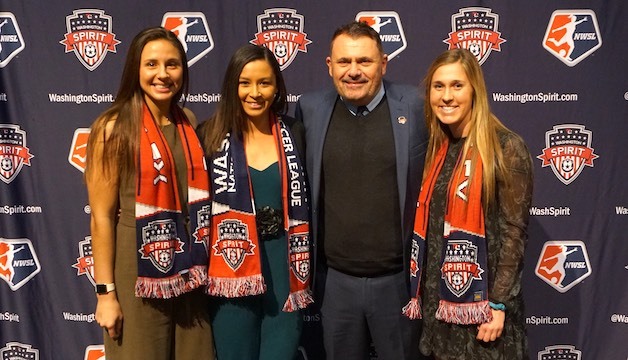 CHICAGO (Jan. 10, 2019) – After completing two trades for additional first round picks in the lead-up to the draft, the Washington Spirit made four of the top nine selections in the 2019 NWSL College Draft on Thursday. Washington selected four players in the first round: midfielder Jordan DiBiasi from Stanford, defender Samantha Staab from Clemson, defender/forward Tegan McGrady from Stanford and midfielder Dorian Bailey from North Carolina. During the draft, the Spirit also acquired a second round pick from Portland Thorns FC, and selected forward/midfielder Bayley Feist with the 17th overall pick. DiBiasi is a current member of the U.S. Under-23 Women’s National Team and is coming off a senior season at Stanford in which she was honored as First Team All-American and was a finalist for the MAC Hermann Trophy. McGrady is a member of the senior U.S. Women’s National Team, having earned her first international cap on April 8, 2018, against Mexico. She was tabbed as a third-team All-American after a standout 2018 campaign with Stanford. Both DiBiasi and McGrady were members of Stanford’s 2017 NCAA Women’s College Cup champion team along side current Spirit and U.S. Women’s National Team midfielder Andi Sullivan. Bailey, a member of the U.S. U-23 Women’s National Team, started all 27 games for the national runner-up North Carolina Tar Heels as a senior, tallying five goals and three assists. Her most prolific collegiate season came in 2017 as a junior when she netted six goals and assisted nine more, earning second team All-ACC honors. Feist earned second team All-ACC honors in 2018 with Wake Forest. She finished her college career with 78 games played and 61 total starts, totaling 54 points on 22 goals and 10 assists. "I'm really excited for this next challenge and to get to work."